Abrams Flooring provides top notch flooring installation. Abrams Flooring has been providing flooring and services, including flooring installation, for over 60 years. Residents of Lake Worth, Wellington and surrounding areas know that Abrams Flooring is the place to start when they want to freshen up their homes and businesses. Although residential and commercial installations may call for differing materials, the underlying installations hold to the same requirements. Each sector expects that the installation enables the flooring to look beautiful while providing the infrastructure that will withstand wear and traffic demands. Any time work crews are on-site, whether residential or commercial, they are disruptive. The best way to deal with this is to plan ahead. If the space being re-floored is vital for the smooth running of your activities, set up temporary operations in another area. You’ll need to prepare an area close to the installation as a work area. This area can also be used if the flooring needs to be delivered early to acclimate to the space. Materials, like hardwood, expand and contract with different temperatures and humidity. To avoid cracking or warping have it on-hand for how long the manufacturer advises. Your space was measured professionally so the estimate is accurate. 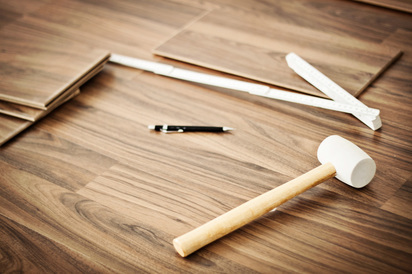 The flooring you ordered and installation costs will be compatible with your budget. In addition to the full year warranty on our labor, installations performed by Abrams Flooring meet the requirements of manufacturers’ warranties and guaranties. When the installers are finished with your project, we will walk though it with you. If something needs tweaking we will attend to it immediately. Abrams Flooring considers a flooring installation complete only when you are completely satisfied with our work.